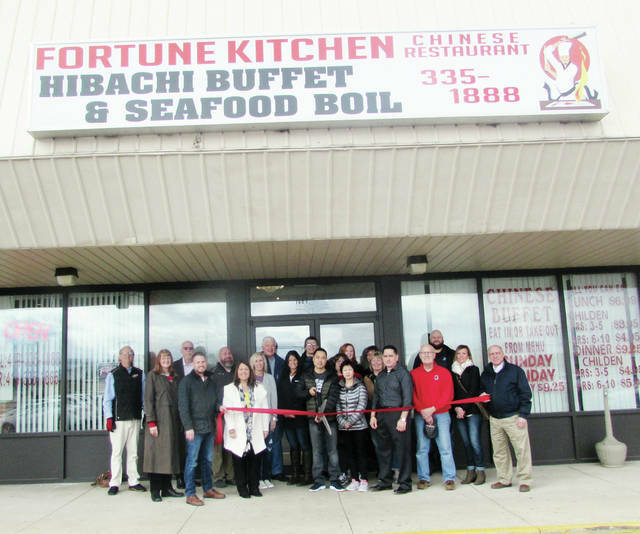 Owner Jenny Lin, right center, and her husband, Zhong Yi Dong, center left, did the honors Friday during a ribbon cutting ceremony for Fortune Kitchen, located at 1487 N. Shoop Ave. in Wauseon. The restaurant was closed for several weeks to add a hibachi grill and a seafood broil. The menu now includes crab, lobster tail, shrimp, mussels, and clams, among other additions. Also pictured are Wauseon Mayor Kathy Huner, members of the city’s Chamber of Commerce, and area media representatives. https://www.fcnews.org/wp-content/uploads/sites/45/2019/03/web1_fortune-kitchen.jpgOwner Jenny Lin, right center, and her husband, Zhong Yi Dong, center left, did the honors Friday during a ribbon cutting ceremony for Fortune Kitchen, located at 1487 N. Shoop Ave. in Wauseon. The restaurant was closed for several weeks to add a hibachi grill and a seafood broil. The menu now includes crab, lobster tail, shrimp, mussels, and clams, among other additions. Also pictured are Wauseon Mayor Kathy Huner, members of the city’s Chamber of Commerce, and area media representatives.